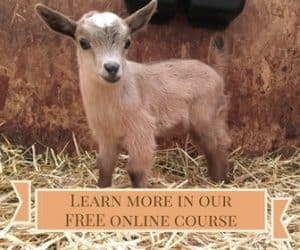 During this 4-part series, you have hopefully learned all the steps and instructions needed to successfully train your goat to pull a cart. Each post went through the information rather fast because of the small amount of space I’ve had to share it with you. This post will hopefully answer any remaining questions and will provide you with working goat troubleshooting tips follow-up. What do I do when my goat just won’t respond to training? 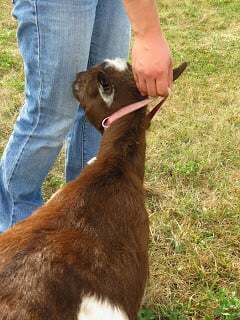 One of the biggest keys to training a goat is patience — and a lot of it! Remember that this is a journey and that the instructions I’ve given are not one-size-fits-all. Some goats are going to take longer than others. The key is to be patient and positive throughout the experience. When you encounter a goat that is really stubborn and is just not getting it, try slowing things down for him/her and increasing the amount of praise you give. Go back a step perhaps. Or discover what it is that motivates this goat. While I warned against food motivations and reward, that may be just what your goat needs. I had one doe who just needed that incentive to walk forward. The only thing is you must be careful with it once you reach the cart stage. You don’t want your goat caring more about the food than its task. Another suggestion is to train the goat with a buddy. Goats are herd animals and some just don’t want to be alone. Grab a friend (the goat and human kind) and do some duel training! Have one walk in front of the other or train them side-by-side. Figure out what works for your goat and keep going. My goat is terrified of the cart. What do I do? Walk the goat next to the cart while someone else pulls it. Let them see it and hear the sounds it makes when in motion. Encourage the goat to get up close. Remember to work slowly with fears and animals. 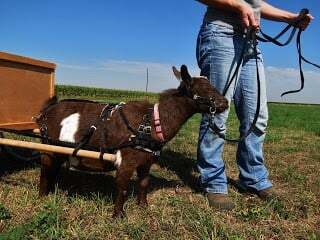 Don’t overexpose the goat to the cart, but do short sessions of exposure and positive reward to let your goat know the cart is not to be feared. Another suggestion is to have someone else drive the cart while you walk beside the goat, stopping frequently to praise its good behavior and performance. My goats run with the cart instead of walking. How do I fix this? This is a common problem with a semi-obvious answer. 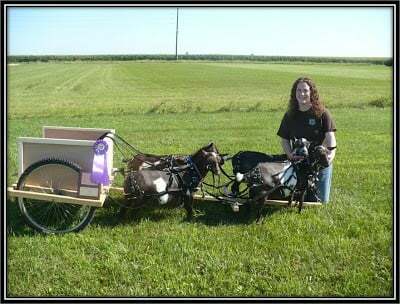 Usually when your goat is running with the cart, one of two things are happening: Either your goat is afraid of the cart or it isn’t a challenge for them. If its number 1, see the previous question. To answer the second one, what your goats are probably telling you here is that the cart is too light and so running is quite easy. And it’s not entirely their fault. If the cart is too light, it easily rolls down a road or driveway, meaning its most likely pushing them forward. To solve this, add more weight to the back of your cart to help slow them down. If, on the other hand, they are simply running to be running, have a helper walk alongside the goats, pulling them back to instruct them that running is not desired at this moment. Also NEVER allow a goat to run back to its barn/pen. This only creates problems. Always walk your goat home. 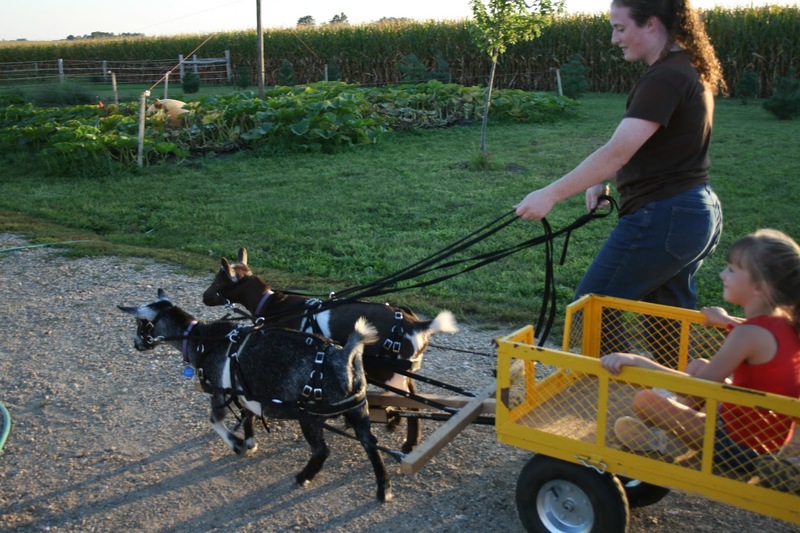 As stated many times before, training your goat to drive is a journey, not a three step process. This journey requires a lot of patience, time, and energy on both parts to be successful. Don’t become discouraged if you are stuck on a skill for a long period of time. 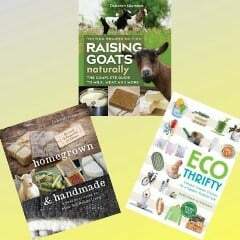 If my ideas don’t work, think of your own and discover what it is that makes your goat tick. Never give up – especially when you’ve already put a lot of time and effort into it. Like every good thing in life, this takes practice, practice, practice. Work hard, make it positive, and above all, have fun on this journey with your goats! If you have a question that wasn’t answered in this post, please feel free to leave a comment and I’d be happy to help you out. To review any of the steps, see the list below. 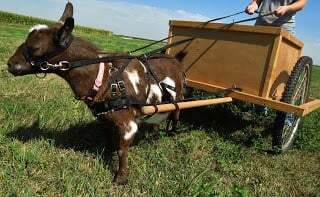 Hi, my name is Jeremiah and I was wandering if you had any instructions for building a goat cart. My brother and I made one, but it is a kinda' bad. If you do, do you know where I can get the materials. Thanks for any help. Hi Jeremiah! Sadly, I don't actually have any instructions for cart building. My dad built the cart a couple of years back for me. But, I can tell you that the wooden cart you see is basically just two bicycle tires, a 2×4, and a sheet of plywood. That's really all that went into it. Its hard to tell from the picture, but the "box" part of the cart actually comes off the frame. The frame is just built from that 2×4, holding the bicycle tires into place. The box was made from plywood and has grooves on the edges that allow it to sit on top of the box. Let me know you have any other questions!